Cottage Playhouse - Who Has The Best Cottage Playhouse? 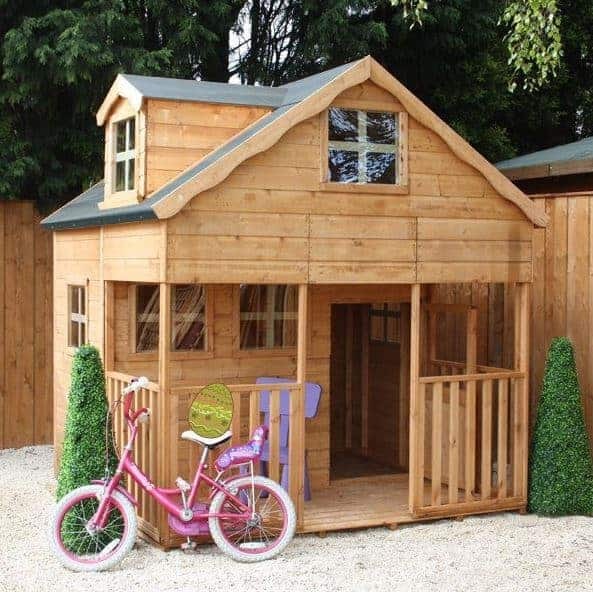 A cottage playhouse is not only a great environment for your children or grandchildren to have fun in, and of course that means they’re keeping fit and learning important life skills at the same time, their traditional design means that they can also be a beautiful feature for your garden. The only difficulty can be finding the one that’s just right for your garden and for your little angels. That’s why WhatShed have created this handy guide to help you find an ideal cottage playhouse available to buy online today. When searching for cottage playhouses, we were very pleased to find fifteen high class and unique models worthy of a place in our league table. We’ve ranked them according to their price and value for money, their durability, their visual appeal and fun factor, and more. We’ve reviewed playhouses in all styles, sizes and substrates, so just what is a cottage playhouse? 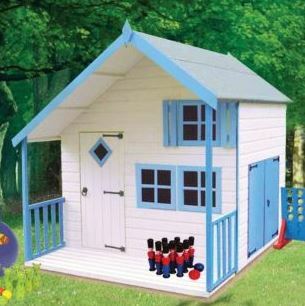 Firstly, it has to have a traditional design, so although they’re very practical you won’t find plastic playhouses here. They also have to be on ground level, rather than being raised towers, and have to have a pleasingly rustic appearance. This is often aided by an offset roof, dormer windows, verandahs and picket fences. Above all they had to offer something special that would give them a cottage appearance at the same time as appealing to kids. This exacting criteria ruled many playhouses out, but we’re pleased to have found fifteen of the best. This was a diverse category, so choosing our champion was difficult. Well done then to the Rowlinson Swiss cottage, which thanks to its fun design, long warranty period, and great value for money, is named the best cottage playhouse that can be purchased online in the UK right now. Whether you want a playhouse or a summer house, WhatShed bring you unbiased and independent reviews that can help you make an ideal purchase. A top quality cottage playhouse should perform two functions: it should look great in the garden, and it should also provide a spacious and fun play area for the children or grandchildren in your life. 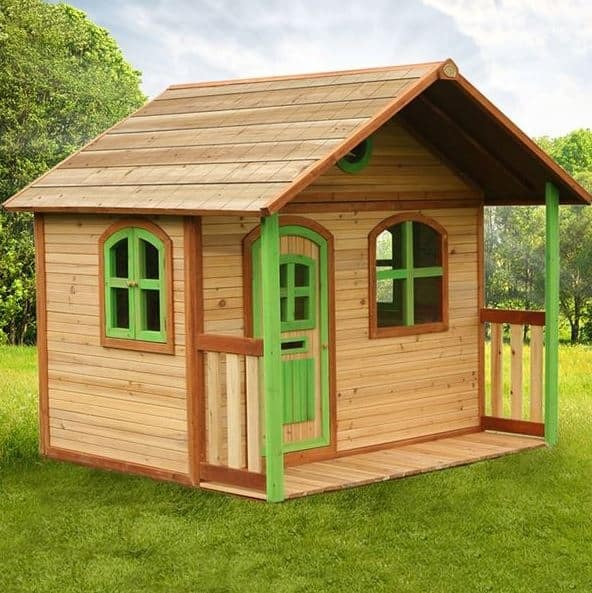 This Swiss cottage style playhouse from Rowlinson more than meets both of these requirements, and for a two level playhouse with an eight foot by seven foot base area, we also think the asking price of not much more than six hundred pounds represents excellent value for money. 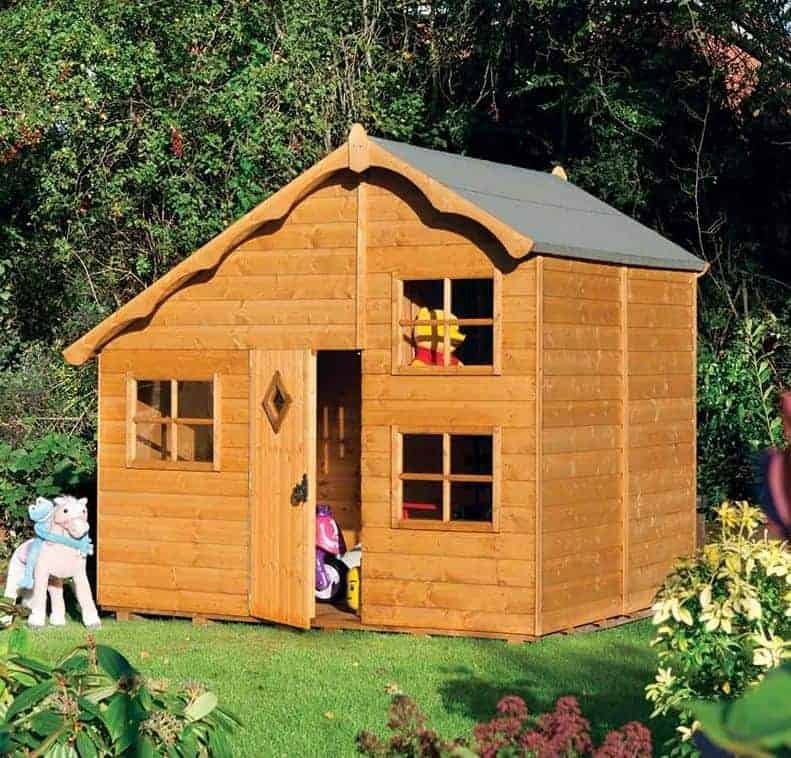 The ten year warranty period gives added value, and is another reason that this good looking playhouse finds its way to the top of our league table. The offset apex roof was the first thing to catch our eye when we saw pictures of this cottage playhouse, and it brings advantages for kids as well, because it means that there’s an upper level as well, giving even more space to play in and for them to indulge their creativity and imaginations in. This upper platform has a safety rail across it, and is accessed by a ladder, so adult supervision will be needed. Like all of the cottage playhouses that have earned a place in our guide, however, it meets the EN71 European child safety standard, which is something that we always find reassuring. This is a relatively compact cottage playhouse, being one storey high and having a base area of 1.52 x 2.05m. This makes it a good choice for use by smaller children, however, and it means that it can also be used on gardens where available lawn space may be in short supply. What we particularly liked about this playhouse, however, is that the tongue and groove timbers have been pressure treated by the manufacturers. This brings with it a 15 year warranty, and it also means that the customer doesn’t have to spend time and money adding their own preservative coatings on an annual basis. This very useful feature is unique among the cottage playhouses we’ve reviewed, and helps this take the runner up spot in our league table. The integrated picket fence helps to create the cottage playhouse appearance that is such a design classic, and we also liked the stable style door. We were pleased to find safety hinges uses as well, giving added protection to little fingers. Added protection from the weather is provided by way of the overhanging roof at the front, creating a canopy that also gives a shaded area on hot, sunny days. 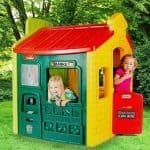 If you want a very durable and long lasting playhouse, this could be the one for you. This cottage playhouse has a look all of its very own, and that’s something we always like to see as it creates a garden feature that parents and children alike can be proud of. What makes this so unique is that it has a dormer window that’s set into the side, rather than being front facing. The front itself has an overhanging upper section, above a wooden verandah section that has a wooden balcony running around it. We found it very striking, and as this is one of the most visually attractive playhouses we’ve reviewed it more than earns its place inside the top three of our league table. Being built upon two stories, and with a base area that’s approximately seven foot square, there’s a large area for your little ones to enjoy. 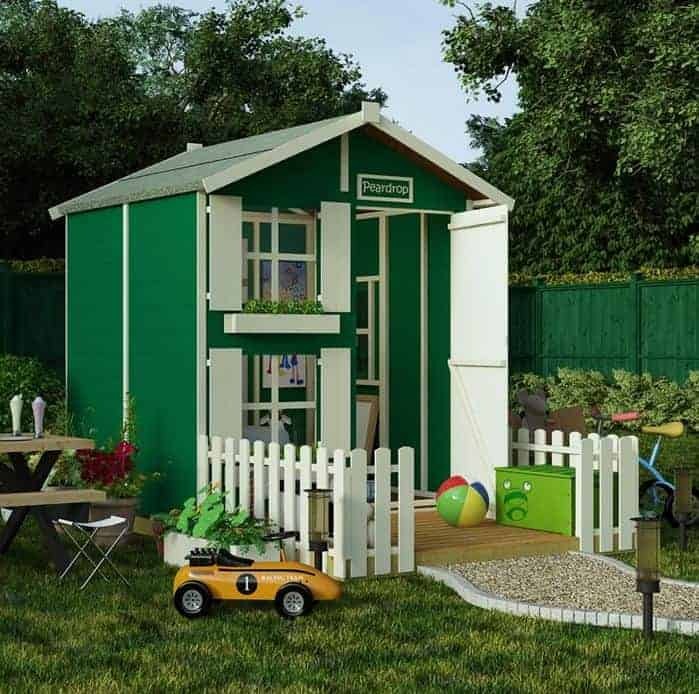 That’s why we feel that this cottage playhouse could be ideal for those who have two or three children who would like a playhouse, and it also allows children to invite their friends around to share in their play. 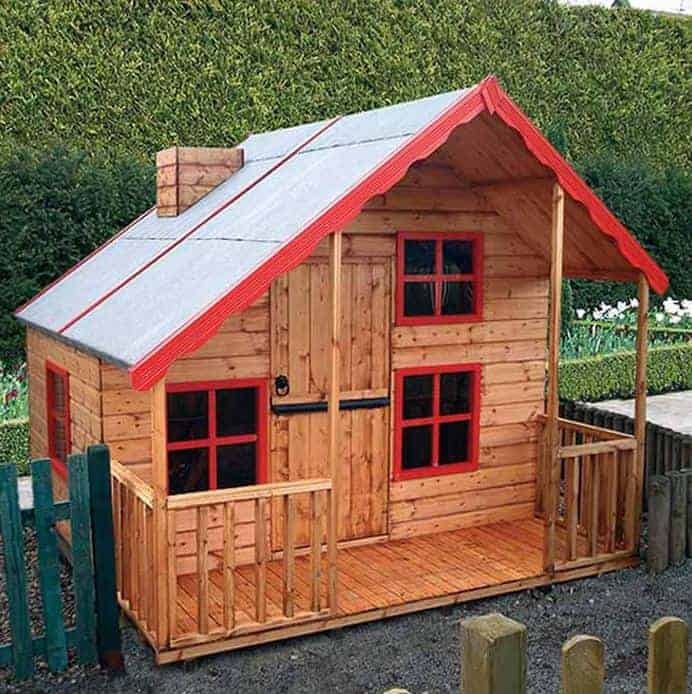 With a 10 year warranty included as well, and high quality components used as shown by the use of 12mm thick smooth planed tongue and groove cladding, we feel this represents very good value for money for such a good looking and versatile playhouse. 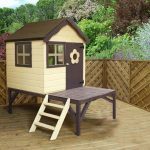 This is the smallest cottage playhouse to gain a place within our WhatShed league table, with a base area of 1.84 x 1.54m and a ridge height at the top of the playhouse’s apex roof also of 1.54m. This makes it a perfect choice for those who want to buy a first wooden playhouse for their children however, especially if they have a restricted amount of space on which to position it. 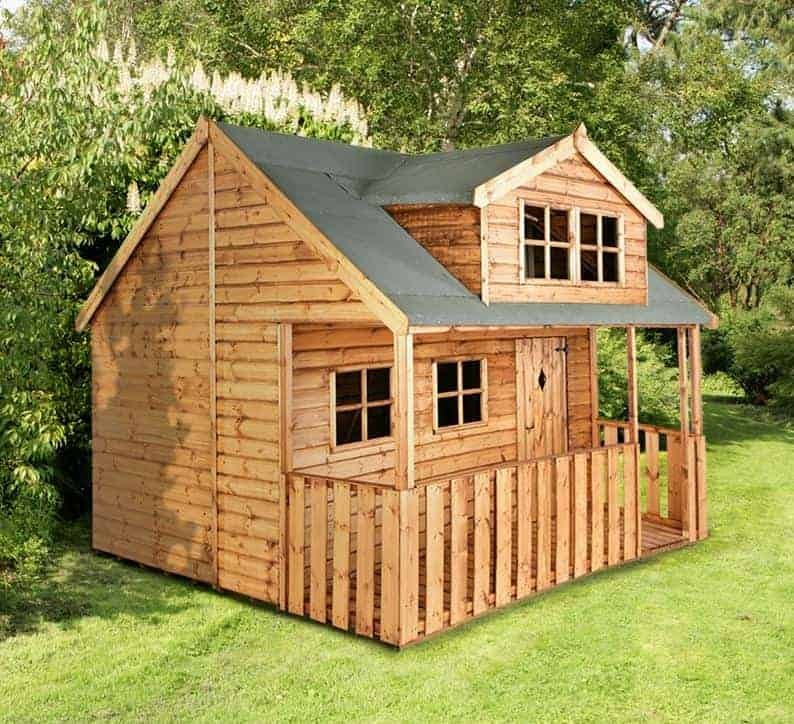 It’s also the cheapest playhouse here that comes with an extended guarantee against rot, and this excellent value for money is enough to carry it into the top five positions in our list. It may be relatively small in size, but we still found that it delivered on visual appeal. It has a built in wooden verandah, with rails on either side, and we particularly liked the stable door as the upper portion is glazed and so helps to ensure that the interior is filled with light on a sunny day. The glazing itself is made of 2.5mm thick styrene, which is very tough and virtually shatter proof, so that’s one less thing to have to worry about. Square windows on the side panels also help to provide extra illumination, so there[s lots of natural light to either read or play by. Once again we have a two story cottage playhouse, and that makes it a very flexible building as well as a very exciting building for the little ones in your life. In effect it means that the playhouse comprises two separate areas, so we can imagine the main ground floor area containing a selection of toys and games, while the upper section could contain books to read or colour in as the child looks out of the window and down at the garden below. We found this a visually striking cottage playhouse, and we were pleased to see that BillyOh have brought the stylistic flourishes that we’ve often found in their sheds that we’ve reviewed. One example of this that caught our eye is the use of shutters around the three well sized windows, and the positioning of window boxes below them. This means that you can teach your children how to plant and look after flowers, as well as creating a playhouse that’s even more attractive. 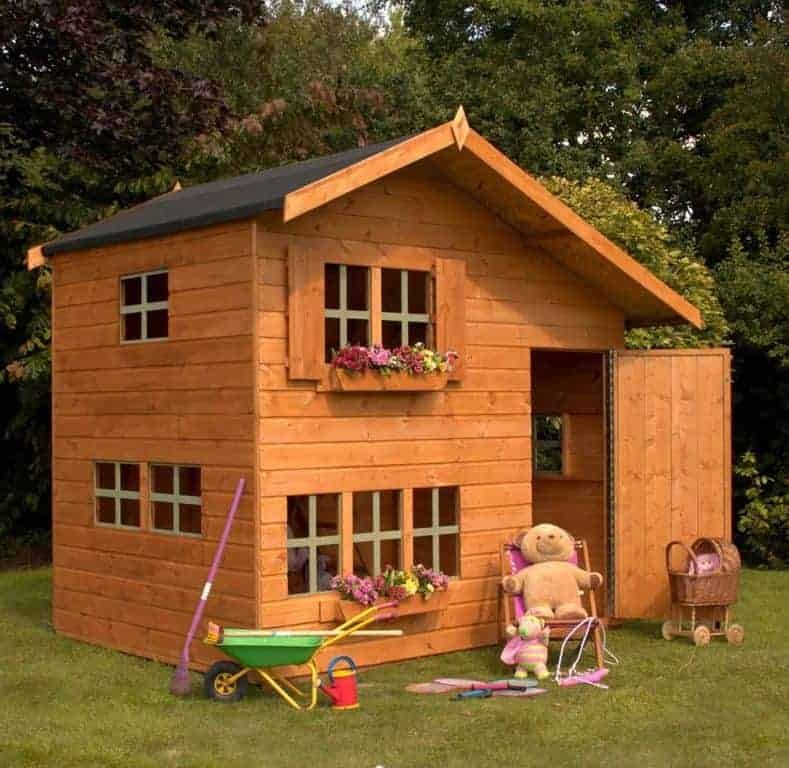 This playhouse is also available without a picket fence, but the price above is for the version with a fence added to it as this gives it a cottage like appearance. Only the lack of an extended warranty prevents this from being ranked even higher. 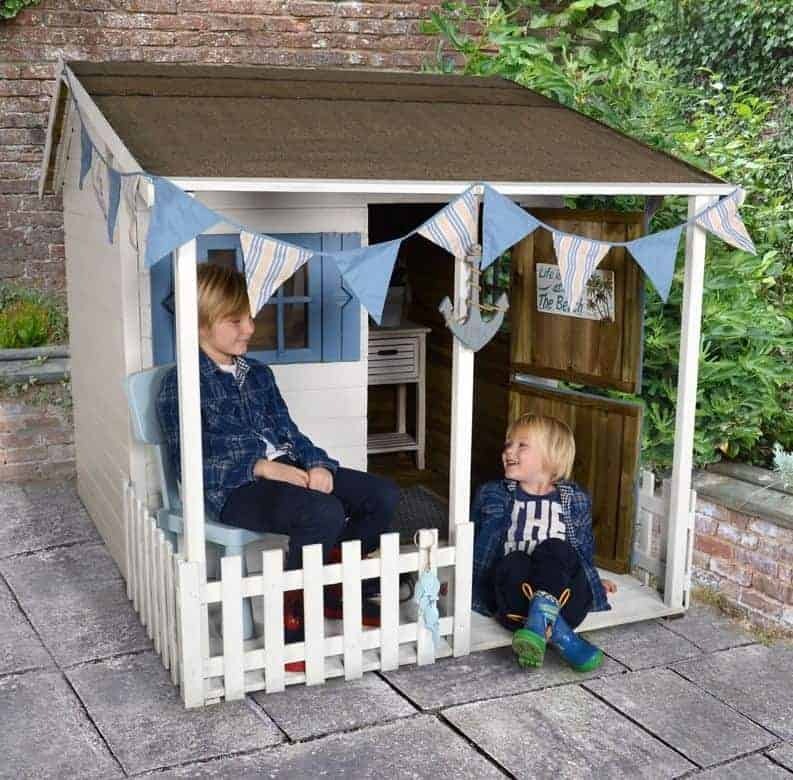 We always feel that seven foot by five foot, as demonstrated in this case, is an ideal size for a cottage playhouse, as it provides more than enough room for two or even three primary age children to play inside, and yet doesn’t take away too much space from the garden itself. Further space is also available in this particular model as it features a loft on the second floor, accessible by means of a safe and sturdy interior ladder. Entrance to this cottage playhouse comes by way of a stable door, which is something we always like to see on playhouses as they are safe and lots of fun for children to play with as well. We also liked the cut out wooden butterfly which is situated on the upper half of the door; it’s a little touch but one that is sure to catch the eye of children, especially if it’s painted in an exciting colour that contrasts with the door around it. We were pleased to see shutters in evidence again as well, as they can be used to easily control the amount of light and heat entering the building, so creating a cool and shaded area in the summer months. With a ten year warranty included as standard, this can be a good value purchase. Because a cottage playhouse is typically very well designed and made from high quality timber, they can sometimes be a little more costly than other varieties of playhouse. That doesn’t mean that they have to be out of reach to those who are operating on a limited budget however, as this six foot by four foot playhouse shows. 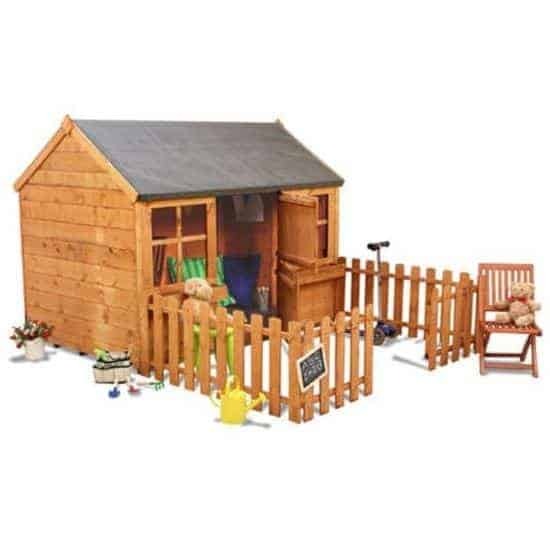 It’s available for not much more than two hundred pounds, and that’s with an extending picket fence included, and so is an ideal choice for those who want to give their children the benefits of having a playhouse but don’t have a large budget available for the purchase. It’s this that gains it a place in the top half of our league table. We would have liked to see an extended warranty offered, rather than the statutory one year cover provided on this occasion. With tough and durable components used throughout we wouldn’t let this put you off a purchase however; as long as it’s given a regular treatment of wood preserver we wouldn’t be surprised to find that it’s durable and weather resistant. It should also be noted however that it comes without a floor as standard, although adding one, as we would heartily recommend, costs less than thirty pounds. This is an imposing two level cottage playhouse that has a base area of eight foot by six foot, so there’s lots of room for your children to explore and play inside. Once again we have an offset apex roof, as the upper level is used to house a loft area, meaning that two level fun can be had within a safe environment. This offset roof is also very effective at quickly carrying rainwater away, and as this can also help in the fight against rot we were pleased to see that reflected in the provision of a ten year warranty period. The roof is also a very eyecatching feature, but what struck us most of all about this cottage playhouse was just how much glazing there was. In fact, there are five square windows at the front, and six on the sides, all containing safe and practical styrene glazing. This will mean that on a sunny day the interior is likely to be as well lit as any that we’ve seen in a mid sized playhouse. For that reason, although this playhouse could be used for just about any purpose, we feel it’s particularly suited to children who like to read comics, books, or magazines in their playhouse, or who like to draw pictures or indulge in other craft activities. We’ve reviewed lots of Axi playhouses, an exciting brand that often uses very modern shapes and colours that are particularly appealing to children. 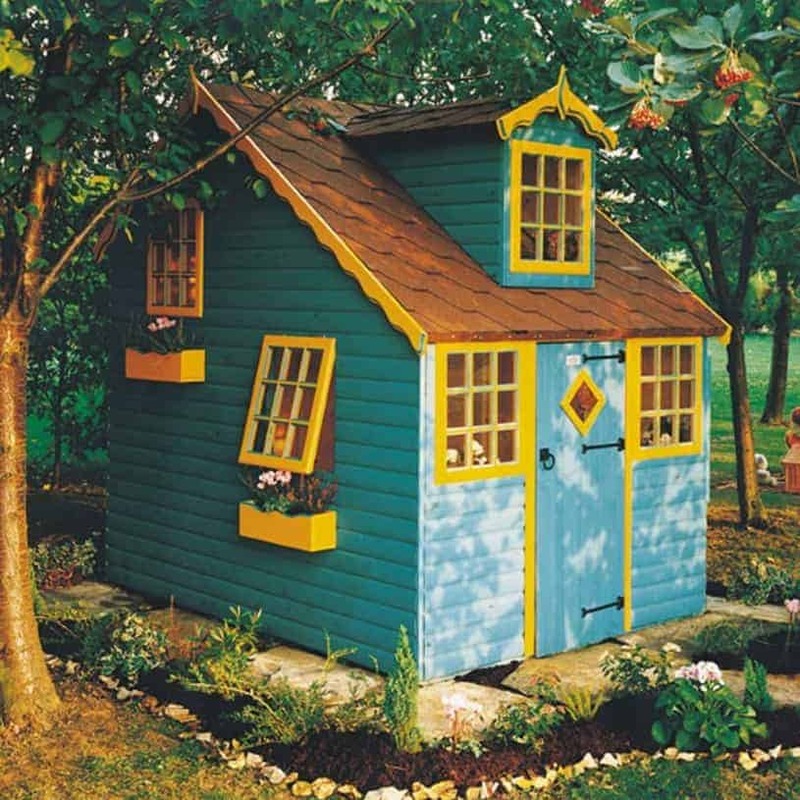 This six foot by six foot cottage playhouse is much more restrained and traditional, and yet we are pleased to report that we still found it very striking visually, and it certainly stands out from the crowd of playhouses that we normally see. We were also pleased to see that it comes with a 5 year anti-rot guarantee, which although not as long as some still provides a welcome reassurance. It’s only the price, slightly higher than average, that keeps this from achieving a much higher ranking. We found lots of stylish little touches on this cottage playhouse that we liked, and which we feel young ones will like even more. For example, the three windows and the single hinged door all feature arched rather than straight tops. The door itself also has a letter box style opening, which lends itself to a multitude of play scenarios, and we also like the round porthole like window above the door, which is both fun and practical. 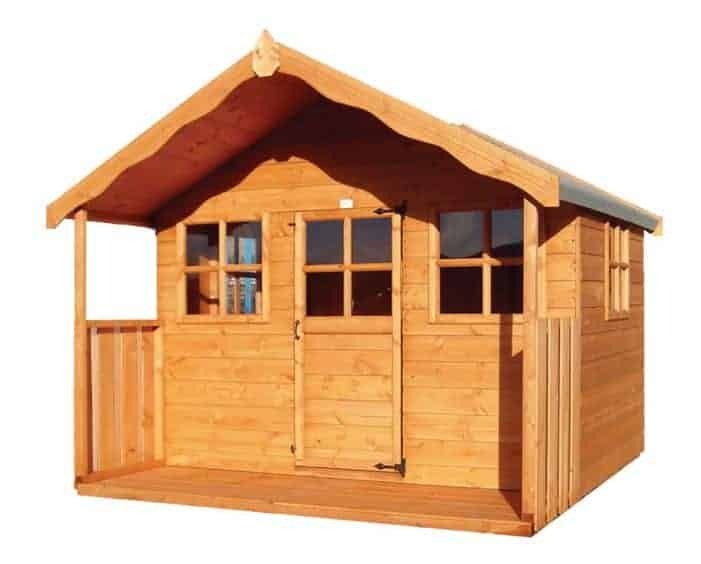 As fun and practicality is the ideal combination for a cottage playhouse this comes highly recommended by us, if you don’t mind paying a little extra for its undoubted quality. A cottage playhouse is a great place for your children to burn off excess energy, relax in their own private space, or simply to spend time with friends and siblings developing those social skills that will be so important in later life. All of these reasons make them a great purchase, but this particular cottage playhouse adds an extra element as it’s been design with aesthetic appeal for adults in mind as well. In our opinion this could be more than a playhouse, it can be a garden feature in it’s own right that’s sure to grab the attention of friends and neighbours. The unique design of this cottage playhouse caught our eye for all the reasons, and the first thing that struck us was the dormer section in the centre of a reverse apex roof. We also liked the attractive shingle effect upon the roof, which is something that we very rarely see on a playhouse. There’s lots of windows too, and we were glad to note that some are opening so that ventilation can be achieved on hot days. With window boxes and a 10 year warranty included as well this has a lot to recommend it, and it’s only a relatively high price tag that sees this remain in the bottom half of our top fifteen league table. This two tiered cottage playhouse comes with a lot of original and very useful features, and it’s also one that instantly caught our eye thanks to its long canopy formed by an overhanging apex roof. It gives added protection from the elements, and also provides a handy shaded area outside the main entrance to protect your kids from the harsh sun on summer days. This can also be used for a game such as skittles or boules, and with a seven foot by six foot base area there’s lots of room inside as well, upstairs and downstairs. One feature of this cottage playhouse we particularly liked was the set of outward opening double doors built into the side panel of the building. They’re an attractive addition and also make it very easy to get in and out, which can come in very useful for energetic children as it means that they can enter through the main door and then run out through the side door. The single hinged front door has a diamond shaped window, which we found a neat touch, and antique style hinges, giving this a classic look that children and parents alike will love. The only negative points are the lack of an extended warranty, and a slightly higher than average price tag. 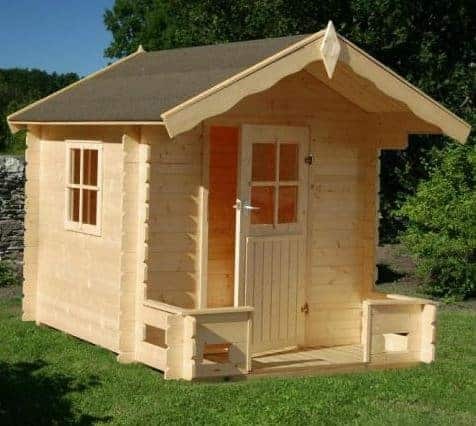 This is a very traditional looking cottage playhouse, so we feel that it will fit in particularly well with gardens that already have a lot of elegant wooden features in them. One classic touch that we like is the Georgian style cross hatching on the windows, so that whilst this functions very well as a mid sized playhouse that children and grandchildren will enjoy, appearance wise it looks like a miniature summer house or log cabin. We were pleased to see that safety has been taken seriously by the manufacturer, as this is always a primary concern when we review a modern or cottage playhouse. Whilst the windows look very traditional they utilise acrylic safety glass, which although clear is virtually shatter proof. We were also glad to see that the single hinged door has an anti-trap plastic strip on it, protecting little fingers. The roof canopy here is one of the longest we’ve seen, at a foot long, and with the verandah and timber rails below helps to enhance the cottage appearance. 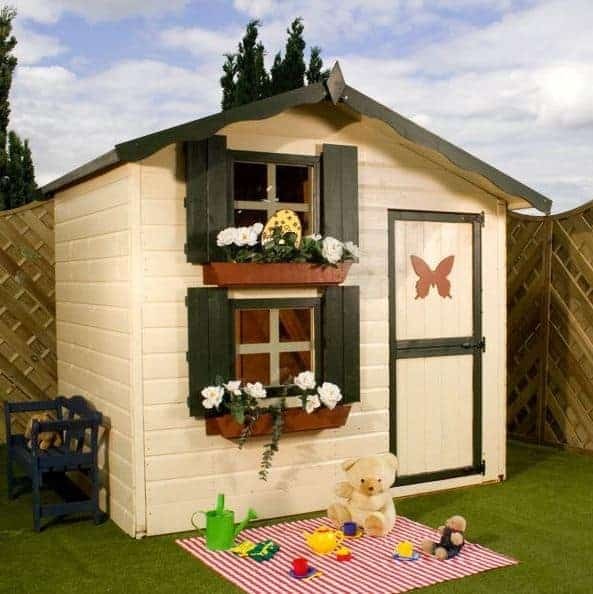 If you want a good looking playhouse that uses high quality components throughout then this deserves to be on your shortlist, even though it comes without an extended warranty as we would have liked to see. 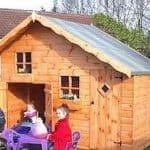 A high quality cottage playhouse, as featured within this league table, is always going to be a great place for your children to play, but play can be even more fun and even more useful when its shared with friends. That’s why this Swiss cottage style playhouse scores very highly in our opinion. It’s the largest playhouse to earn a spot within our top fifteen list, and its base area of 3.05 x 3.05m means that there’s enough room for multiple children to play in, especially as this is a dual level playhouse. It also comes with by far the highest price tag however, and it’s this that accounts for its relatively lowly position, especially as it only comes with a one year guarantee against rot. Appearance wise the first thing that struck us was the dormer window that looks out from the bunk. It’s a great spot for children to look outside and watch nature go by, so it encourages inquisitive minds. We found this very attractive, and it should look even better once it has been treated, but the customer will have to do this on a yearly basis. Nevertheless, if the price of over one and a half thousand pounds is encompassed by your budget then you should make this one of the first cottage playhouses you consider. This mid sized cottage playhouse is very attractive even in its basic state, thanks to its offset apex roof, stable door with brass style fittings, and verandah. It also has an upper tier, making it eminently suitable for those who have more than one child, as one could play downstairs while the other reads a book or plays on a favourite computer game in the upstairs bunk area. What we especially liked about this cottage playhouse, however, and what gains it a place inside our top fifteen league table is that it can be customised at the point of purchase. One option we found particularly attractive is that a chimney can be added which gives the building as a whole an added dimension and even more visual appeal. That option costs an extra fifty pounds to implement, which we feel is reasonable. It’s also possible to add floor bearers, always a useful feature on a wooden garden building, and to add a side door. The frame can also be painted either red or black. All of these options cost money, of course, and this is already a comparatively expensive cottage playhouse, which is why it sits in the penultimate position within our guide when it could otherwise achieve a much higher ranking. This one storey six foot by six foot cottage playhouse from Palmako bears all the hallmarks we’ve come to expect from this manufacturer’s garden buildings, in that it’s strong and sturdy and yet stylish at the same time. It also has a very traditional design, which means that it may have particular appeal for slightly older children, as well as their parents and grandparents. We found its overhanging canopy, with diamond shaped finial, and compact verandah pleasing on the eye, but it should be easy to give it a more exciting look that will appeal to younger children with the judicious use of some vibrant paint. 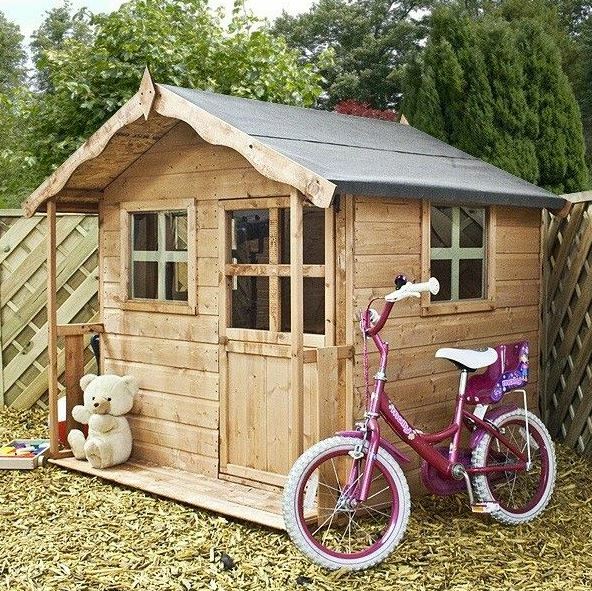 This cottage playhouse should feel very tough and stable once assembled, and that’s because it uses tongue and groove cladding allied to a thick frame. Extra strength and weather protection is given by the integral chalet connectors, which is something that we very rarely see used on a playhouse. 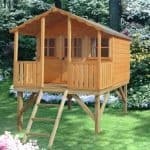 That means that this would be a smart playhouse choice for gardens that are in an exposed or often windy area. 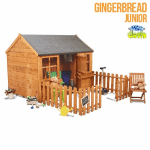 We found a lot to like about this playhouse, but its lack of an extended warranty against rot as well as its above average price tag see it remain in the final spot in our WhatShed top fifteen league table.